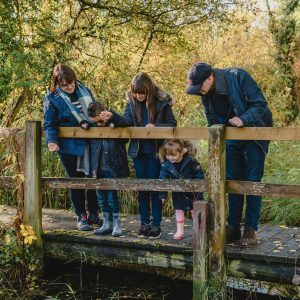 There are so many amazing ways to celebrate the Spring season, from going outside to enjoy the beautiful weather to smelling the newly-bloomed flowers. One of my favorite ways to celebrate the season is to make a fun Spring-inspired dessert. 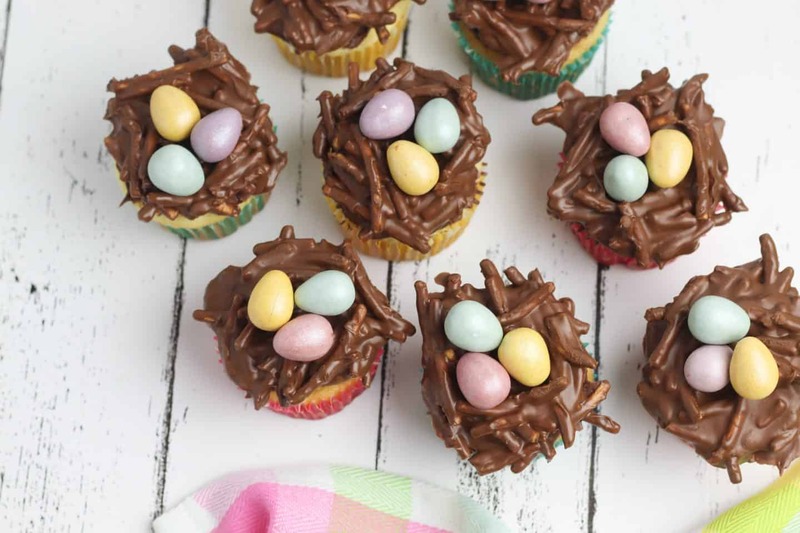 And these adorable Nutella nest cupcakes are the perfect way to celebrate Spring! 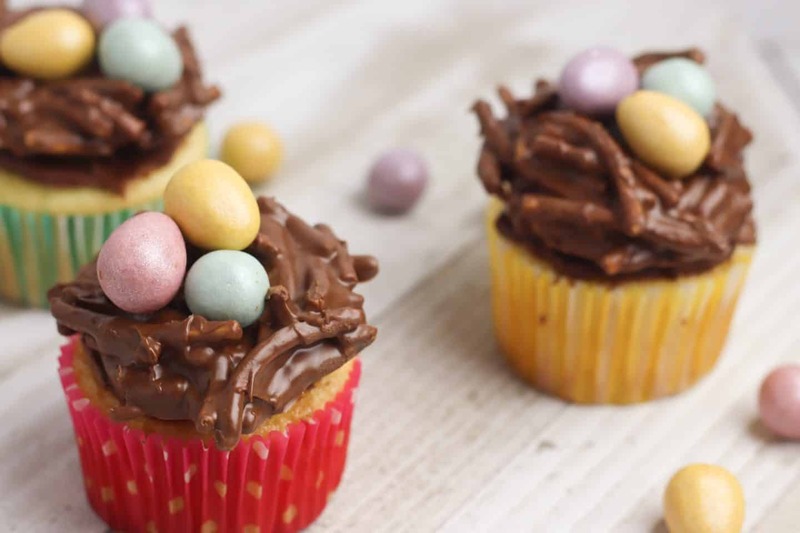 These cute cupcakes will make a big impact at any Spring celebration. 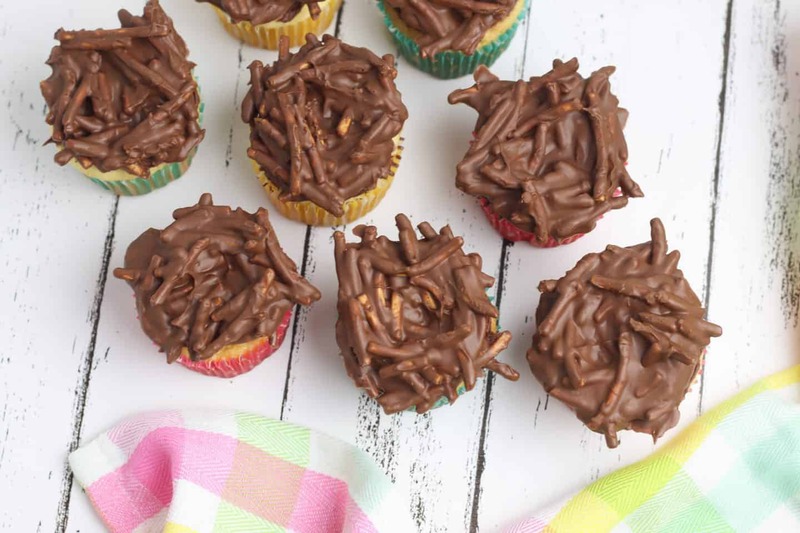 But the best part about these amazing cupcakes is that they’re so simple to make, yet everyone will think you slaved in the kitchen to make them! Since these cupcakes use a basic cupcake and icing, I’m going to focus my instructions on making the cute nest toppers today. 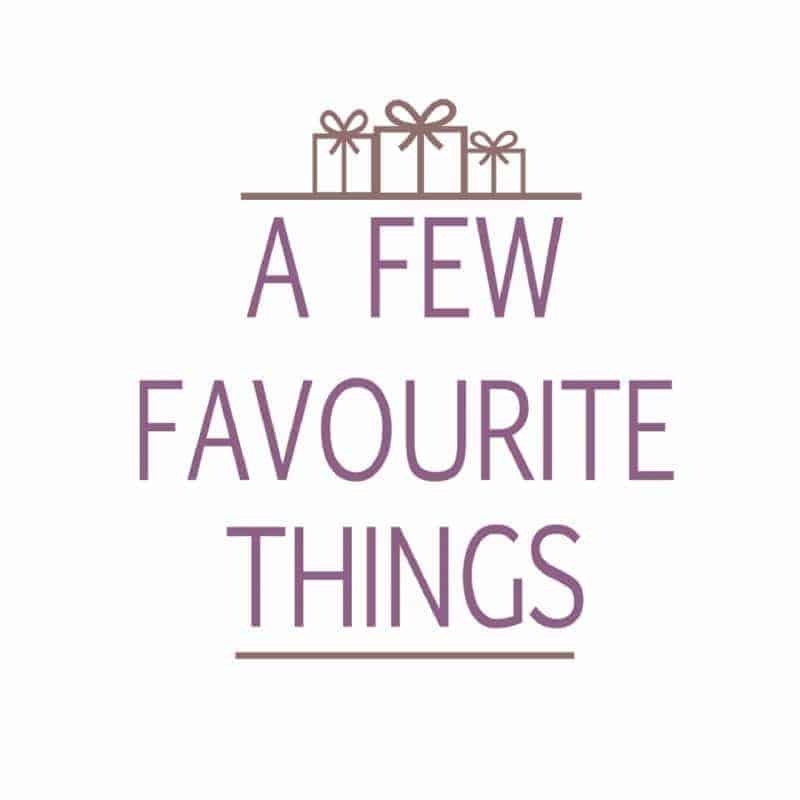 So, start by making your favourite vanilla cake and chocolate frosting. It’s fine to use a boxed cake mix and premade frosting! Bake the cupcakes and set them out to cool while you prepare the nest toppers. 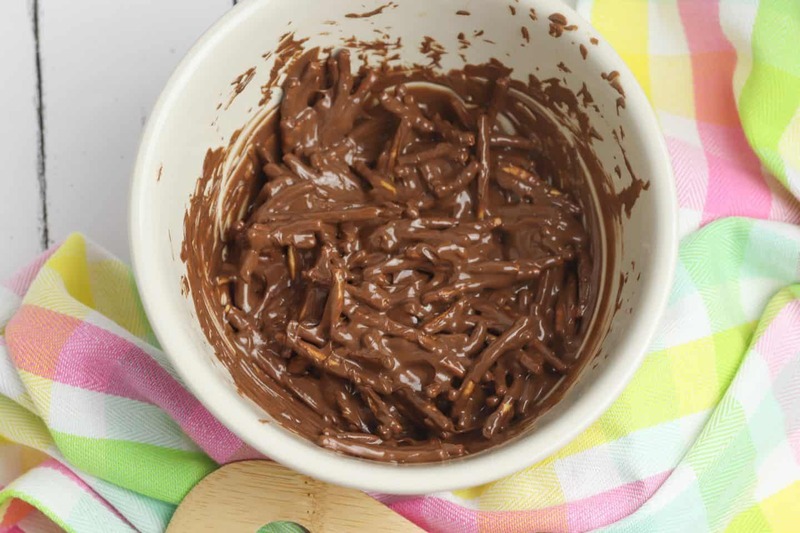 To make these cute no-bake nests, place your Nutella, chocolate chips and peanut butter chips in a large microwave safe bowl. You can also melt the mixture in a saucepan on the stove. But I prefer to use a microwave for this step because it cuts back on the number of dishes I have to wash when I’m finished! To melt your chocolate chips in the microwave, place the bowl in and heat for 30 seconds on high. Remove the bowl and stir to combine the ingredients. If the chips aren’t melted, place the bowl back into the microwave and heat it again for 30 more seconds. Remove the bowl and stir again to make sure everything is mixed well. Pour your chow mien noodles directly into the bowl with the Nutella mixture and stir to combine. Don’t worry about crushing the noodles as you stir. Breaking the noodles into smaller pieces makes it easier to form the nests, so it’s a good idea to break apart the noodles while you’re stirring. 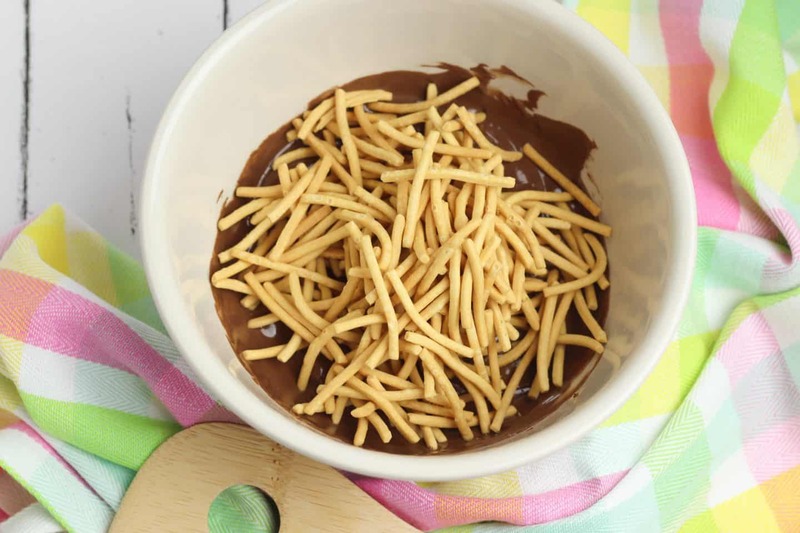 When the noodles are coated with the chocolate mixture, use a spoon to scoop out the noodles and place them on a piece of wax paper. Then, use your fingers to form a nest shape with an indention in the middle. 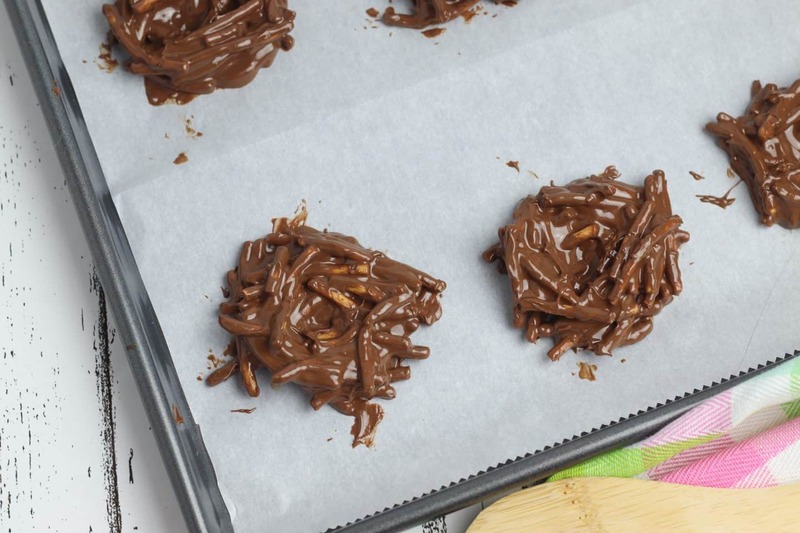 Allow your chocolate nests to rest on the wax paper until the chocolate sets. 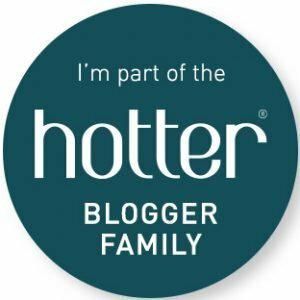 You can speed up the setting process by putting the nests in the refrigerator to cool. As you wait for the nests to cool, spread a layer of chocolate icing on top of your cooled cupcakes. Then, place a nest on top of each cupcake. 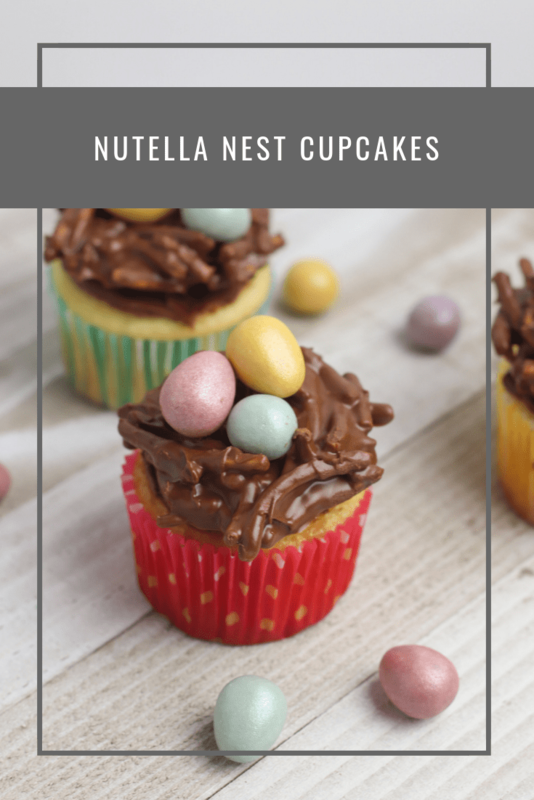 Finish each Nutella nest cupcake by placing a few candy coated chocolate eggs inside each nest. Bake the cupcakes according to package directions. 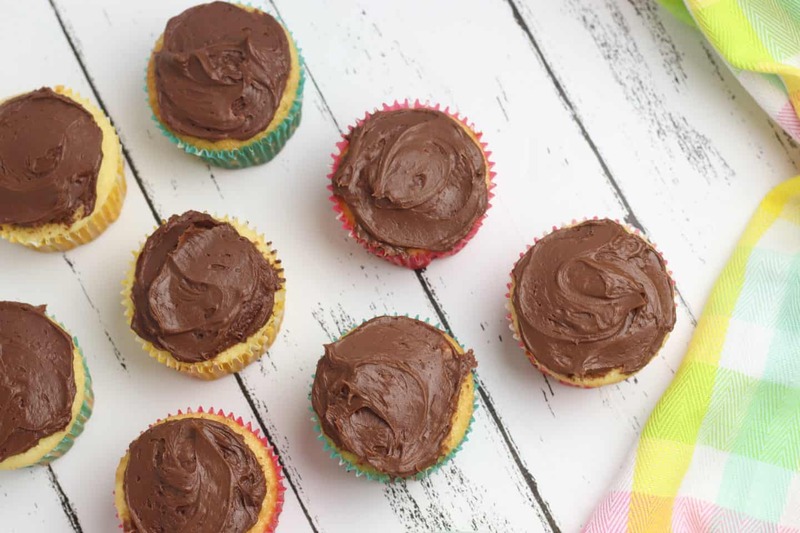 Allow to cool, then place a thin layer of chocolate frosting on top of each cupcake. 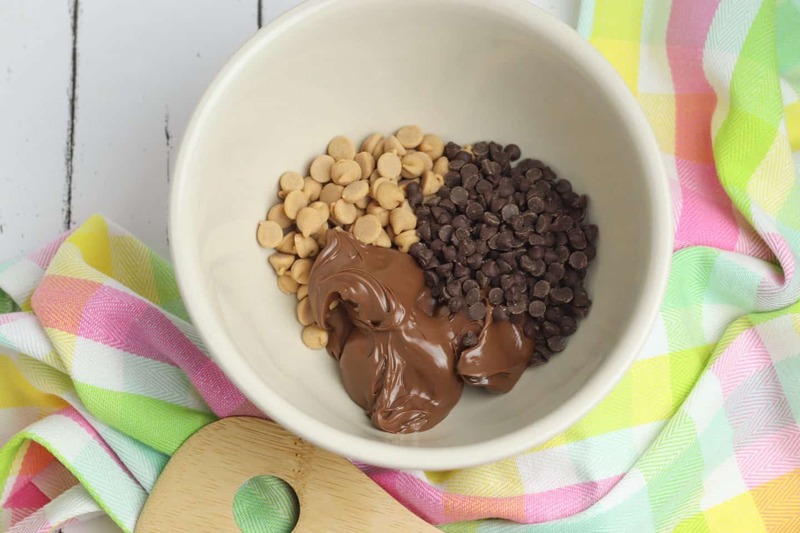 In a large bowl, combine the hazelnut spread, chocolate chips, and peanut butter chips. Microwave on high for one minute, stopping halfway through to stir. Pour the chow mien noodles into the hazelnut spread mixture and stir to combine. Press the spoon into the mixture to break apart the noodles as you stir. Using a spoon, scoop out a spoonful of the chow mien noodle mixture and form it into a nest shape with your hands. Place each nest on a piece of wax paper to cool. To speed the cooling process, place the nests in the refrigerator. Once the nests have cooled, the chocolate will harden. Place each nest on top of a frosted cupcake. Add three mini chocolate eggs to the centre of each nest. 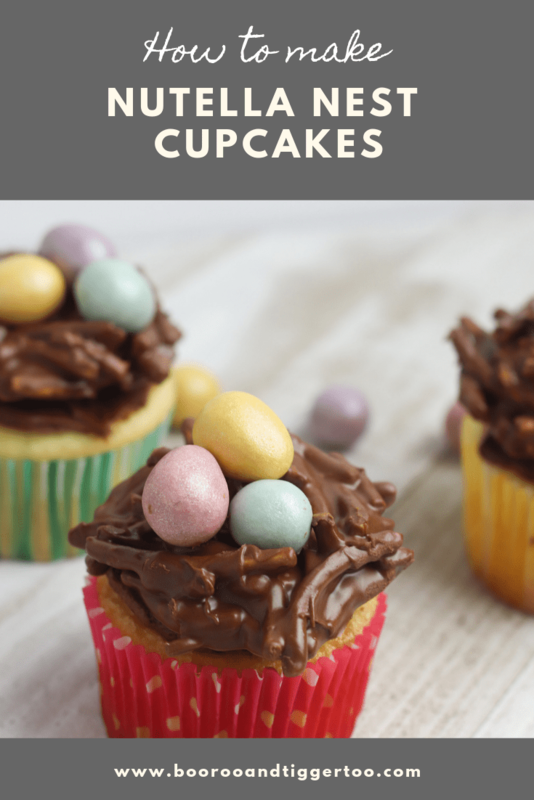 Ah this fills me with nostalgia, I used to love making Easter egg cupcakes when I was a kid. These look delicious! These look like a great Easter treat! These look absolutely delicious. My girls would love these and they are perfect for Easter. I think the use of the Chow Mein noodles is really creative, it looks like a real nest. I made cornflake clusters today but this sounds like 100% better! This would be a great recipe to get the children involved and have a lot of fun with an afternoon baking session. I love the idea of using the noodles to have a crunch. Oh yum! 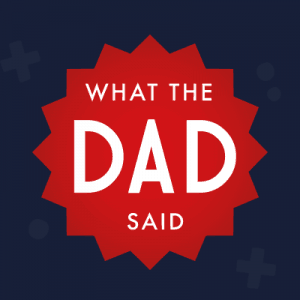 I think we’ll try these this week while the kids are off. I love Nutella!